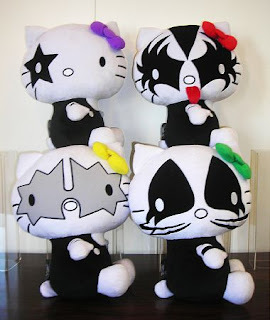 Sanrio have just announced that they will be making Hello Kitty cross-over plushies based on the American Glam Rock Band Kiss. The Hello Kitty plushies are all based on the album cover of Kiss' Dynasty album. The dolls will be sold by Sanrio, but Kiss singer Gene Simmons has announced they will also be selling them at their concerts. A price and date have yet to be set though, but we can only assume it will be within the next few months. This is not, however, the first time that Sanrio have created a cross over Hello Kitty plushie with a rock band, they have previously based them on Japanese Visual-Kei band X Japan, cleverly named 'Visual-Kei Kitty'.